You can get $5 off select magazine subscriptions at Magazines.com when you enter code FOURTH at checkout. 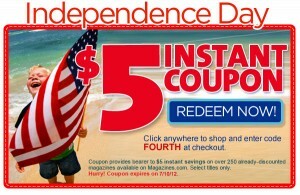 Coupon code is valid through July 10th, 2012. Not valid on ANY magazine, just on 250 pre-selected titles…the same ones that these coupons are always valid on.